These are some of the countries that say they are afraid of Iran. Between them they have thousands of deadly atomic weapons. 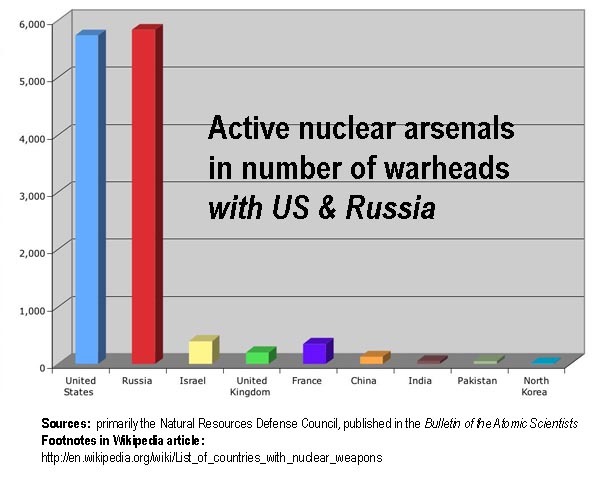 But note that Iran has no nuclear weapon, no nuclear weapon program, and no prospect of a nuclear weapon for at least 10 years (according to the US National Intelligence estimate) even if they decided they wanted one, which SecDef Leon Panetta says they have not. Iranian supreme theocrat, Ali Khamenei, has given a fatwa that nuclear bombs are forbidden in Islamic law, and it is likely that Iran does not want to construct an actual nuclear weapon.